One of my favourite places to take photos of Ref is inside our home. There are a couple of reasons for it too. The first is I love capturing the every day moments and with Ref being an indoor pug for 98% of the day, his life unfolds in the home. The other reason is that cause he does spend most of his time inside, he is so much more relaxed and willing to have his photo taken inside. 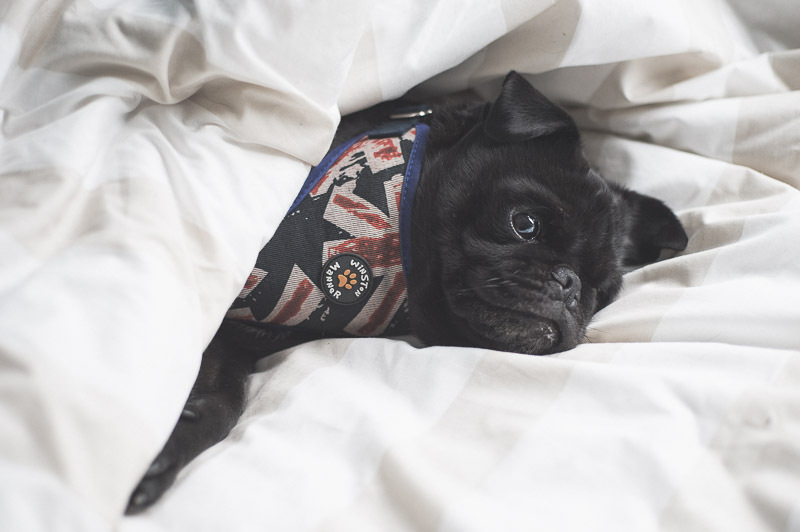 So today I am going to share 5 simple tips for indoor pug photography. Light is the single most important element of photography cause without light, you won’t have a photo. Look for which room has the most light coming from a window at different times of the day. Without a doubt, my bedroom is great for taking photos any time of the day. The lounge room on the other hand is only good toward to the middle of the day and if I open the blinds up fully. So seek out the light and make use of it. The more light you have, the better the photo will be. But if you find the light coming in through windows is really bright, try using a sheer curtain or white sheet over the window to create a nice soft light. Avoid use overhead lights as they will cast shadows on your pugs face and are very unflattering. Also avoid using flash at all costs as it can not only unsettle your pug, it will create horrible red eye too. Your background can make or break a photo. So before you start taking photos, have a look around and see if there is some clutter you can get rid of that will make the photo better. Put toys away or move some cushions from the lounge to give a more spacious look. A spacious bed with a light coloured quilt cover can make for a nice backdrop, just avoid those busy quilt cover designs. Or when in doubt, use a plain wall as your backdrop. It doesn’t even have to be a white wall. You could use that bright coloured feature wall as a backdrop too. 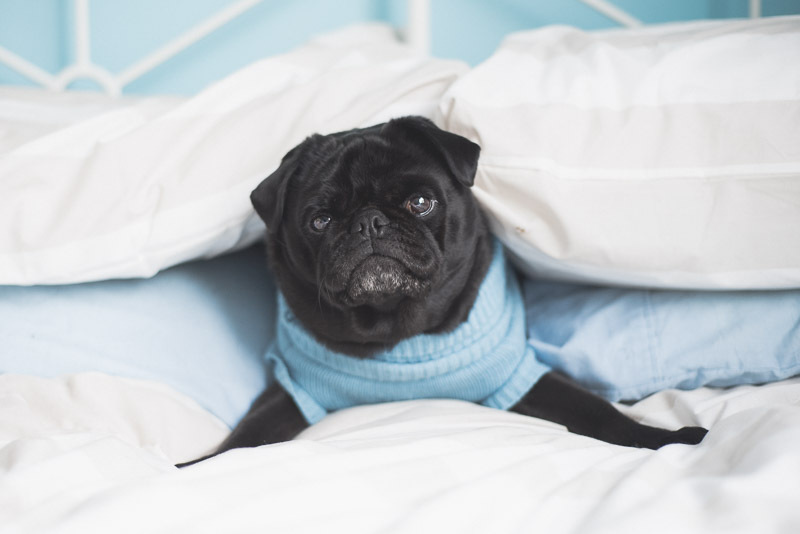 Before you take the photo with your pug in position, be sure to have a good look to make sure there are no objects in unusual places like the corner of a cushion coming out of your pugs head. It is quite common to photograph your pug from how you see them but a photo can show so much more character and quality if you change your perspective. Get down to their level and show a different side to your pug. There are times that photographing them from above works, like when they are sitting in a bed of autumn leaves, but keep this to a minimum. See how your photos change when you change your position. Even try having your pug higher than you giving them a strong powerful look in your photos. Everyone knows the phrase “safety in numbers”. Well it applies to photography too, just in a different way. So when I talk about safety in numbers, I mean the amount of photos you take. The more you take, the more likely you will get that one great photo. I will take 3 or 4 photos of the one pose so that I get at least one good photo from it. And when you go to edit the photos, pick the best on of the sequence and discard the rest. Might as well save that memory card, computer hard drive space or phone memory for more photos. If you stop and think about some of your favourite photos you have seen of dogs around on the internet, you will find a common theme amongst them. Eye connection. 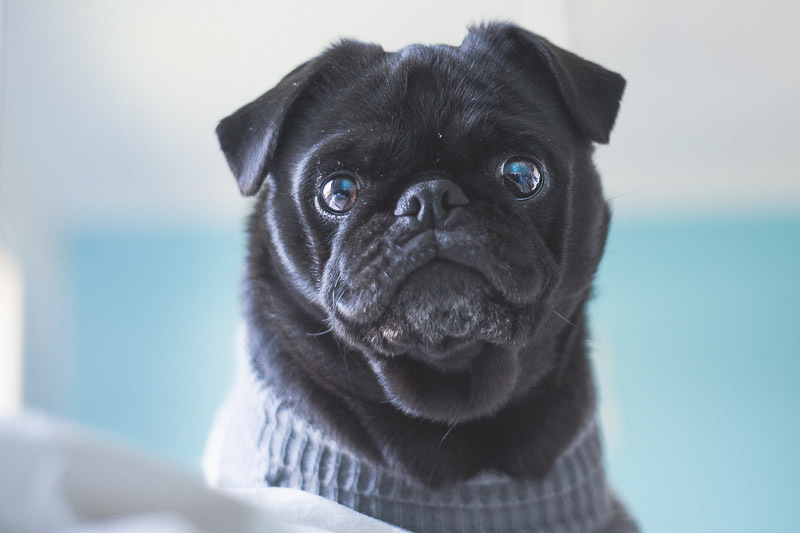 Have your pug looking into the camera as much as possible as it will help create a connection with the viewer of the photo. Connection is also important if you are including people in your photos with your pug. 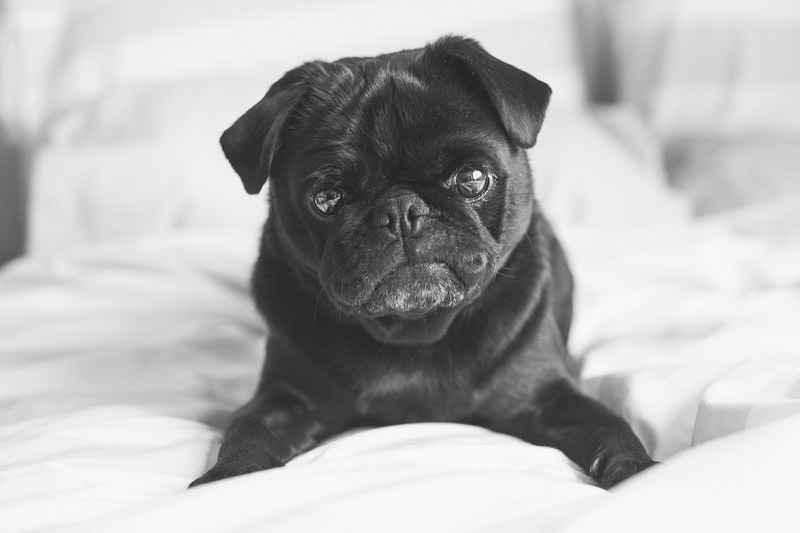 It is not just about having both your pug and human looking at the camera but capturing the connection between them so try getting them looking at each other too. 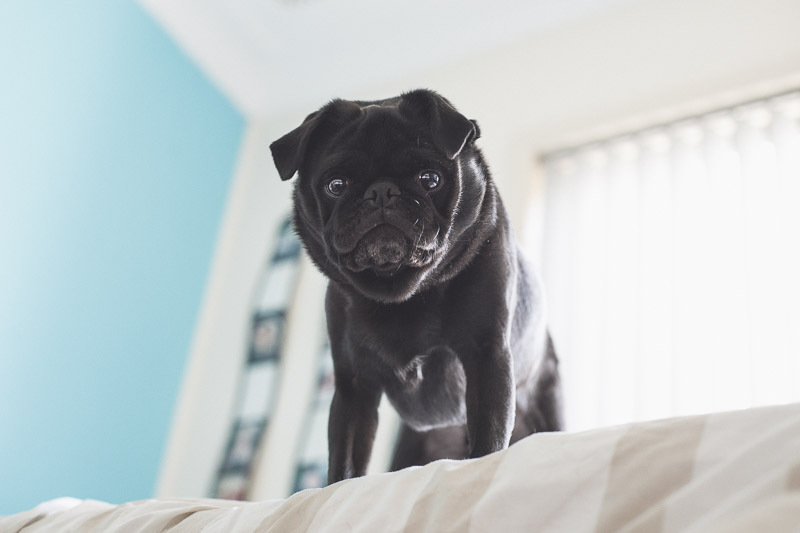 Check out these tips on how to get your pug to look at the camera. 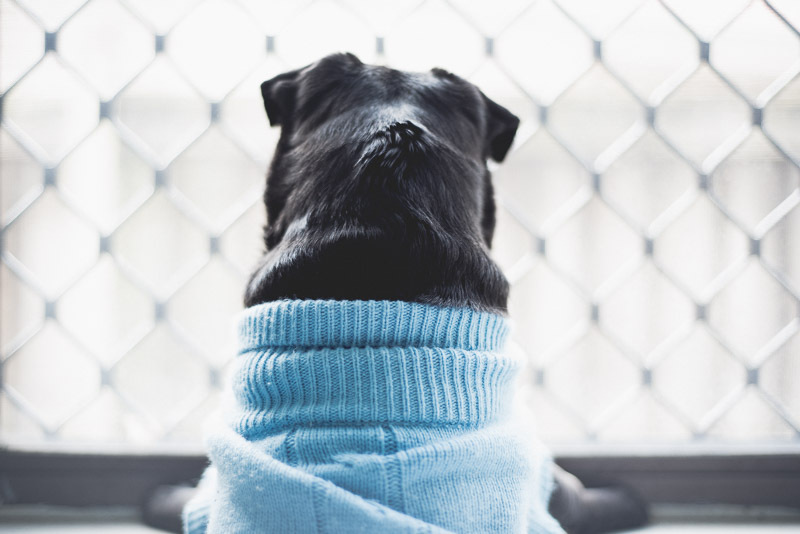 There you have it, 5 simple tips to help you get that great photo when you and your pug are inside. Great to try out on a cold windy day or a hot summer day when you just don’t want to be outside. A perfect boredom buster whilst capturing memories. Do you have some handy tips you have picked up over time to help get a good indoor photo? Share them with us in the comments below.